A hundred years ago cancer was a relatively rare disease that usually attacked only the aged. Today it is a leading cause of death in the United States. When you ask what might lie behind such a burgeoning epidemic of a noninfectious disease, the answers are paradoxically very complex and really quite simple. The complicated part is unraveling just what happens to make the orderly existence of a cell become wildly uncontrolled when it is exposed to certain substances. We still don’t understand much about this. Here’s the simple part: many cancers start from exposures to carcinogens, usually multiple exposures to multiple toxins. Since World War II, we have allowed industry to dump at least 80,000 different synthetic chemicals into our environment,1 and we have further compounded this toxic onslaught by adding a fearful amount of ionizing radiation to our atmosphere from nuclear weapons development and nuclear power plants. 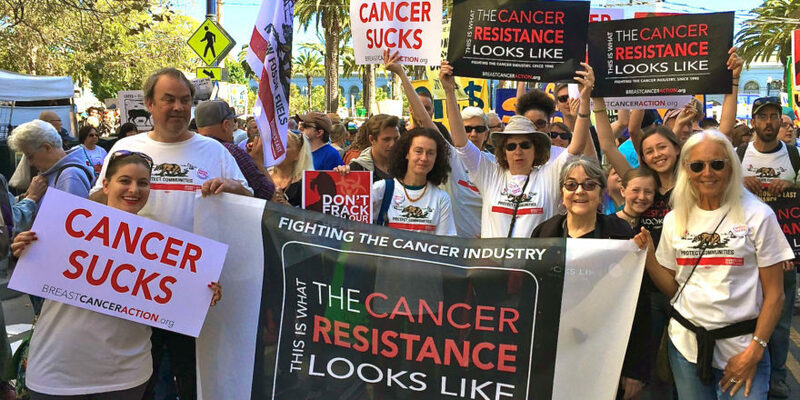 We know that many of those chemicals cause cancer (a look at California’s Proposition 65 list of chemicals will give you some idea),2 and we know that ionizing radiation can cause cancer as well as act as a promoter for malignant tumors. Yet we have very few safeguards to protect us, save for a few woefully inadequate regulatory agencies. Cancer research is ongoing, however, and most of us assume that scientists are vigilant and that their work will eventually find a way out of the mess we’re in and dying from. Though many of us may harbor fears about what surrounds us, we reason that if the scientists haven’t pressured government to curb the lethal practices of industry, then what industry has put into our world—and into our bodies—must not really be the cause of the cancer epidemic. But, what if the scientists on whom we rely have strong motivations to not point the finger at industrial pollution? To be quiet no matter what they see? Even to say out loud that industry’s practices are not the source of this epidemic? To say instead that we get cancer from bad habits (like smoking) and sloppy lifestyles—that it’s basically our own fault if cancer hits us? Would ?1,000 a day for 20 years from one of those polluting industries be sufficient motivation to cast one’s scientific eye elsewhere?3 One of the world’s most famous cancer epidemiologists, Sir Richard Doll, struck just such a bargain with chemical giant Monsanto. Knighted in 1971 for his contributions to the science of epidemiology, Doll criticized many industry practices at the beginning of his career in the early 1950s. But later his views apparently changed, and in 1981 he published a paper that became the standard for estimating what causes cancer, a paper important enough in the scientific world to be cited over 440 different times in the scientific literature.4 In this paper he maintained that smoking was the single most important cause of the disease. He then stated that occupational pollutants might account for 4 percent of cancers and environmental exposures for 2 percent. Two percent. That’s all, despite the fact that in 1964 the World Health Organization had estimated that 80 percent of cancers in industrialized countries were environmentally caused. The remaining percentages, according to Doll, were accounted for by diet and lifestyle issues. As you can imagine, industry hailed Doll’s report; here was the ammunition they needed from the world’s most famous epidemiologist to back up their claims that they were not at fault. In November 2006, an article critical of conflicting interests between cancer researchers and industry appeared in a peer-reviewed journal written by a Swedish professor of oncology and epidemiology, Lennart Hardell.5 Among other disclosures, Hardell and his colleagues revealed that Doll had failed to divulge his ties to Monsanto, a giant biotechnology and agricultural chemical company. That’s scary enough, but that’s not all. Monsanto is a producer of polyvinyl chloride (PVC), a polymer of vinyl chloride. A Monsanto plant in Massachusetts leaked thousands of pounds of the poison vinyl chloride, a known carcinogen used in plastics, into the air for two decades.9 Doll was also paid a £15,000 fee by the Chemical Manufacturers Association, Dow Chemicals, and Imperial Chemical Industries, for a review of vinyl chloride that was published in 1988. The review largely cleared vinyl chloride of any link with cancers apart from liver cancer, a conclusion with which the World Health Organization disagrees. Monsanto was the inventor and merchant of Agent Orange, an herbicide sprayed during the Vietnam War to defoliate vast tracts of land; the millions of people, both Vietnamese and Americans, who came into contact with it have a higher risk of melanoma, chronic lymphocytic leukemia, and prostate cancer.13, 14 Dioxins are a class of chemicals now recognized as among the most potent carcinogens known. One type of dioxin was the principal contaminant of Agent Orange. Monsanto is the producer and sole supplier of rBGH (also known as rBST), the growth hormone given to most dairy cows to encourage greater milk production. The impact of this hormone has frightening implications for breast cancer.16 BCA has published articles about rBGH over the last dozen years, available online at www.bcaction.org/newsletter. Monsanto is the manufacturer and seller of a pesticide called Roundup. Glyphosate, the active ingredient in Roundup, has been linked with various cancers, including non-Hodgkin’s lymphoma, and leukemia in children.17 Roundup is the inspiration for much of Monsanto’s bioengineering of crops that we use for food, genetically modified to withstand the pesticide so that farmers can use even more of it to kill competing plants in a field without destroying the crop. Thus the genetically engineered soybeans you eat have been soaked in glyphosate. Moreover, Monsanto took a Canadian farmer to court who was found to have Roundup Ready crops in his field, although he had never bought any seeds.18 Rather, his field had been infected by the wind-blown seeds of neighboring farms that had grown the bioengineered plants. Still, he was successfully sued for theft of a patented plant, leaving all farmers vulnerable, since there is no way to stop the migration of seeds. In the United States today, nearly 70 percent of foods available in grocery stores contain genetically modified ingredients.19 No one knows what the future holds for health effects, including possibilities of cancer from such food, beyond the obvious risk of elevated pesticide levels. A Monsanto plant in Texas failed to monitor emissions of benzene, a powerful carcinogen associated with leukemia. In 1986, a Texas court awarded $108 million to the family of one worker who died from the exposure. These are only a sampling of Monsanto’s legacy. With friends like Doll, the Monsantos of the world have been free to promulgate their poisons for maximum profit. There is no way of knowing how many thousands—or, more likely, millions—of cancer deaths have occurred (among them, many women with breast cancer) at the behest of this chemical corporation and others like it, all with the silent blessings of scientists like Richard Doll. Judy Brady has been researching and presenting about the politics of cancer for more than a quarter of a century. She is the editor of and an author in One in Three: Women with Cancer Confront an Epidemic, an anthology of writings by women that asks serious questions about cancer through personal experiences with the disease. As a matter of policy, BCA does not accept funding from corporations that profit from, or contribute to, the breast cancer epidemic. To read BCA’s policy on corporate contributions, visitwww.bcaction.org/bcapolicies. When Doll’s relationship with Monsanto came to light last fall, many of his fellow scientists rushed to his defense.20 I cannot help but wonder if this touching loyalty and protests of innocence might have been inspired by a small twinge of collective guilt. His colleagues complain that he’s dead now and can’t defend himself. They argue that Doll gave the money he got from industry to Green College, a medical school at Oxford that he helped found. But since when does how one chooses to spend payola change its color? His defenders further point out that in Doll’s day there was no requirement by scientific publications to disclose financial ties as there is today, apparently assuming that this made hiding such affiliations OK. They credit Doll as a trailblazer in the field of epidemiology, claiming that he really put epidemiology on the scientific map—and that he recognized tobacco as a major source of lung cancer in 1950, long before it became a public issue with the surgeon general’s warning in 1965. All that is true. He was the first to say that cigarettes were a major cause of lung cancer, and he never backed down from that position.